Maintaining proper levels of extracellular polymeric substances (EPS) in wastewater treatment plants can play a major role to improve settling. 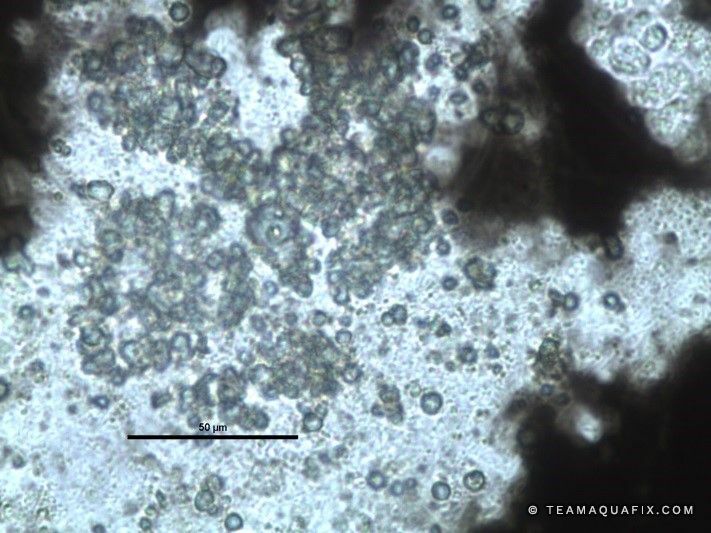 High levels of EPS can easily cause bulking, foaming, and effluent violations, but these substances are also essential for good floc formation and to improve settling properties in wastewater treatment systems. Zoogloea is a genus of bacteria that are commonly known for excreting high levels of EPS in wastewater treatment systems. This page will cover the “what” and “how” of managing EPS and Zoogloea for effective wastewater treatment. This page will cover the definition of EPS and Zoogloea as well as the composition of EPS, conditions leading to high or low levels of EPS, effects of EPS on wastewater treatment, and how to use this information to control and improve settling conditions in a wastewater treatment plant. We hope this article helps you. Aquafix is always looking for new partners in all areas, within the United States and outside of it, and we would welcome hearing from you. For additional technical discussion call us at 888-757-9577 or email technicalservice@teamaquafix.com. You will find our service helpful and friendly. EPS is a general term used to describe excreted macromolecules such as polysaccharides, proteins, nucleic acids, lipids any other polymer compounds (Sheng, Yu, Li, 883). Traditionally EPS is thought of as a carbohydrate slime, but in some cases EPS can be mostly protein. The ratio of proteins to carbohydrates can determine how EPS acts in activated sludge systems. Humic substances, lipids, nucleic acids, uronic acids and other compounds are also commonly found in EPS (Sheng, Yu, Li, 883). The extracellular polymeric substances can occur for many reasons, but generally any form of stress on a system can cause an increase in EPS. EPS is useful for several reasons in wastewater. The primary purposes of EPS are to protect bacteria from toxins, to concentrate food sources in low food conditions, and to allow for the cohesion of bacteria which enables and can improve settling. While EPS is necessary in wastewater, excess amounts can cause significant issues. One of the most well-known producers of EPS in wastewater is the genus, Zoogloea. The image on the left shows Zoogloea extending from floc under phase contrast. 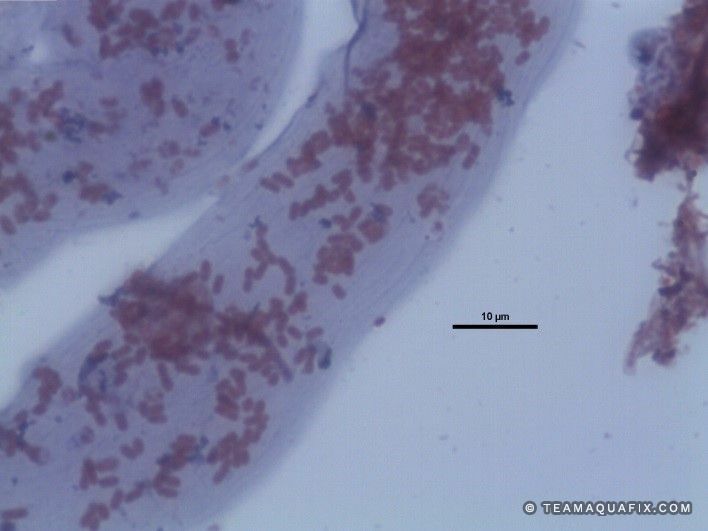 The right image displays the Gram staining properties of Zoogloea. Notice how the EPS stains blue (Gram positive), but the bacteria inside the EPS remain pink in color (Gram negative). Zoogloea is a genus of Gram negative bacteria which include Zoogloea ramigera. These bacteria can exist in any environment which contains high levels of soluble organic compounds (Banks). It’s a common misconception that Zoogloea is necessary in floc formation. Zoogloea can assist in settling, but in fact most bacteria are capable of producing EPS for floc formation (Jenkins, Richard, Daigger, 1). What makes Zoogloea bacteria stand out is their tendency to produce high levels of EPS. This can be beneficial to improve settling, but can also cause serious foaming and bulking problems. As Zoogloea and EPS have a huge influence on settling properties in wastewater, understanding their ideal growth conditions will greatly improve settling control in your wastewater treatment plant. One of EPS’s main functions is to help concentrate nutrients in wastewater, which it does mainly in nutrient deficient conditions. This function is the reason for floc formation in wastewater plants after BOD removal. Toni Glymph’s book “Wastewater Bacteria,” contains an excellent diagram of how nitrogen and phosphorous deficiency can influence the amount of EPS. Bacteria are unable to produce as thick a membrane in nutrient deficient conditions, so EPS forms to make up for the loss of membrane strength and protect the bacteria (Glymph 38). An interesting study of the effects of nitrogen deficiency on EPS generation was conducted by The Institute of Technology in Maebashi, Japan. In this study, the levels of EPS were monitored when the BOD:N ratio in activated sludge was decreased from 100:5 to 100:1. Filaments were present in high populations up until the 100:2 ratio, and EPS levels started becoming excessive at a ratio of 100:1 (Peng, Gao, Wang, Ozaki, Tagiwaka, 293). You will see EPS in bacteria membranes also as a protective response to toxicity. This means that trying to control EPS foaming with chlorination will only increase levels of EPS in wastewater, exacerbating the foaming and bulking issues (Gerardi 111). Zoogloea require high levels of soluble BOD to thrive in a wastewater system. Their ability to generate EPS in high food conditions makes them exceptionally efficient at degrading BOD. Zoogloea can use up BOD so quickly that they cause low F/M conditions for other bacteria in the system, in turn causing that bacteria to produce even more EPS. This means Zoogloea typically dominate filaments in an SBR-style plant, and out-compete them in most continuous flow plants (Jenkins, Richard, Daigger, 68). The fact that Zoogloea require low levels of nitrogen to function which also enable them to thrive in nutrient deficient conditions as long as highly soluble BOD is present. While EPS can be visible macroscopically in some cases, it is generally beneficial to do an India Ink stain to quantify a plant’s EPS levels. Performing an India Ink Stain to identify EPS is relatively simple. Place a drop of well mixed mixed-liquor onto a glass slide. Place one drop of India Ink on top of sample, and then place a cover slip. Observe under 400x magnification with maximum brightness. A Sample with low EPS will appear brown (right) due to penetration of India Ink, and a sample with high EPS will appear white (left) because EPS repels the India Ink. As said previously, EPS levels in wastewater can help or hinder settling of activated sludge. Extreme levels of EPS lead to poor solids separation and dewatering as well as foaming (Gerardi 152). Even so, EPS has the power to help your process as well. A study conducted by Okayama University in Japan displayed improvements in settling time and in COD removal in a lab-scale wastewater system using EPS. The researchers added Zoogloea to a scaled down treatment system as a source of EPS. This addition decreased the settling levels in a 30 minute settling test from 970 to 200. In addition, the COD reduced from 300 ppm to 20 ppm during the test (Nozawa, Takizawa, Kiyohara, 338). 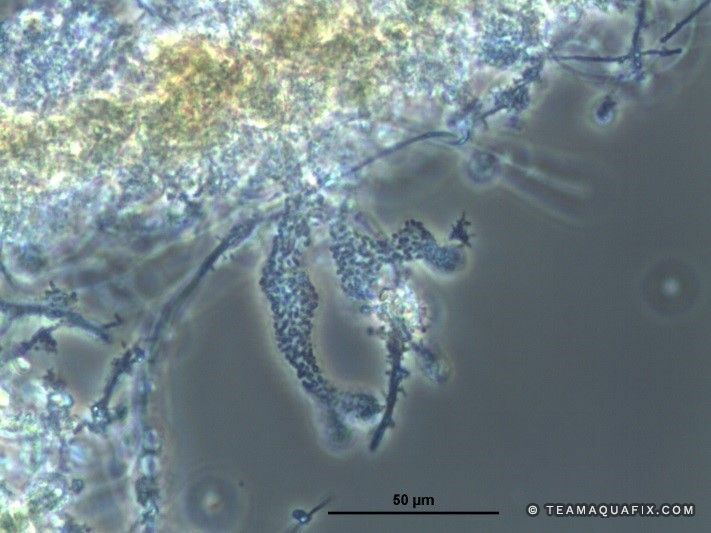 A separate study conducted by the Environment Research Center in Korea used Zoogloea ramigera and EPS to reduce effluent COD levels from 336 ppm to 151 ppm. Simultaneously, they saw a decrease in turbidity from 43.5 Nephelometric Turbidity Units (NTU) to 9.2 NTU (Ahn, Chung, Yoo, Pak, Chang, 919). This shows that an effluent with high COD but low amounts of EPS will become turbid, due to the formation of “pin flocs” which are too small to settle properly. Since EPS plays such a large role in COD removal, and in settling properties, it’s important to understand how changing the EPS present can either improve settling properties of sludge or make things worse. A study conducted by the Department of Civil Engineering in Hong Kong, found that EPS with high levels of proteins tended to yield better flocculation, and EPS with higher levels of carbohydrates tended to yield worse settling properties. With this information in hand, researchers found that adding an biocatalyst that degrades carbohydrates to the EPS produced better flocculation (Sheng, Yu, Li 889). In fact, it was found that decreasing the levels of carbohydrates entering the plant through the influent assisted greatly to improve settling. In some situations with an exceptionally high level of EPS is present, it may become necessary to degrade the proteins in EPS as well as the polysaccharide carbs in order to decrease total EPS content. A Study by the Department of Applied Biological Sciences in Belgium had success reducing protein levels in EPS through heat treatment, and used the addition of a strong acid to reduce the levels of polysaccharides in a lab-scale treatment plant (Neyens, Baeyens, Dewil, De heyder, 86). 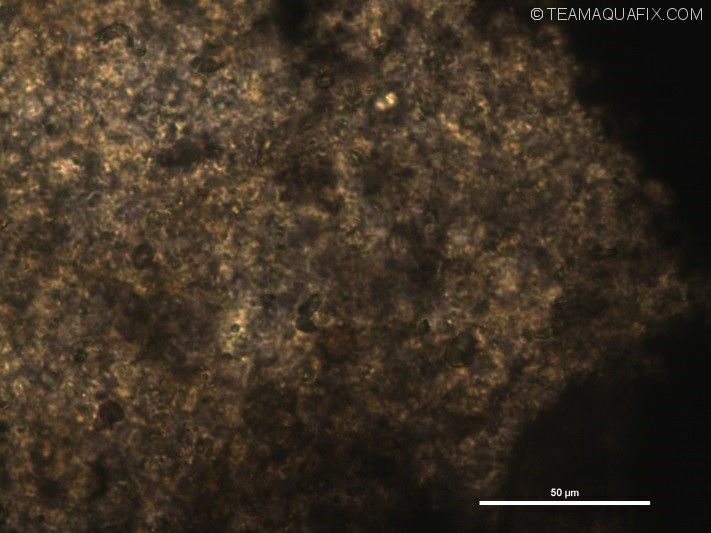 While heat treatment and strong acid additions may be impractical in a wastewater treatment plant, Ferric chloride, and the addition of an biocatalyst to decompose proteins can have a similar effect. A decrease in influent COD (due to the addition of an biocatalyst) in general will decrease the levels of Zoogloea in a wastewater, and an increase in influent COD with a food supplement can improve Zoogloea levels in a wastewater plant struggling with low levels of EPS. Generally, operators in a situation with high carbohydrates and low proteins can add a protein supplement to help non-Zoogloea bacteria generate protein-rich EPS. In a low carbohydrates situation, the addition of a food supplement with high carbohydrates will increase Zoogloea population, resulting in increased EPS. The wasting of excess sludge in a wastewater plant can also assist in removing high levels of Zoogloea when excess slime is occurring. Taking advantage of these methods for controlling Zoogloea and EPS will yield improved settling across the board in most wastewater systems. If your plant is having trouble and need to improve settling or clarification of your effluent, taking control of your plant’s levels of EPS and Zoogloea may help. Aquafix offers treatability studies in order to determine whether wastewater food supplements or biocatalysts will work for EPS control in any specific plant. For more help, contact Aquafix to address your wastewater treatment plant’s problems. Jenkins, D., Richard, M., & Daigger, G. (2004). MANUAL on the Causes and CONTROL of ACTIVATED SLUDGE BULKING, FOAMING, and OTHER SOLIDS SEPARATION PROBLEMS (3rd ed.). Boca Ranton, FL: CRC Press. Glymph, T. (2005). Wastewater Microbiology: A Handbook for Operators. Denver,CO: American Water Works Association. Gerardi, M. H. (2002). Setteability Problems and Loss of Solids in the Activated Sludge Process. Hoboken, New Jersery: Wiley-Interscience. Guo-Ping, S., Han-Qing, Y., & Xiao-Yan, L. (2010). Extracellular polymeric substances (EPS) of microbial aggregates in biological wastewater treatment systems: A review. Biotechnology Advances, 28, 882-894. Bin-Bin, W., Dang-Cong, P., Yin-Ping, H., Hui-Juan, L., Li-Ying, P., & Li-Fang, Y. (2014). The important implications of particulate substrate in determining the physicochemical characteristics of extracellular polymeric substances (EPS in activated Sludge. Water Research, 58, 1-8. Subramanian, S. B., Yan, S., Tyagi, R.D., & Surampalli, R.Y. (2010). Extracellular polymeric substances (EPS) producing bacterial strains of municipal wastewater sludge: Isolation, molecular identification, EPS characterization and performance for sludge settling and dewatering. Water Research, 44, 2253-2266. Nozawa, I., Takizawa, N., & Kiyohara, H. (1987). Restoration of the Ability to Settle Bulking Sludge by Bacterial Seeding in Wastewater Treatment. Journal of Fermentation Technology, 65(3), 333-340. Beyenal, H., & Tanyolac, A. (1997). A combined growth model of Zoogloea ramigera including multisubstrate, pH, and agitation effects. Enzyme Microbial Technology, 21, 74-78. Unz, R. F., & Farrah, S. R. (1976). OBSERVATIONS ON THE FORMATION OF WASTEWATER ZOOGLOEAE. Water Research, 10, 665-671. Williams, T. M., & Unz, R. F. (1983). ENVIRONMENTAL DISTRIBUTIONS OF ZOOGLOEA STRAINS. Water Resources, 17, 779-787. Peng, Y., Gao, C., Wang, S., Ozaki, M., & Takigawa, A. (2003). Non-filamentous sludge bulking caused by a deficiency of nitrogen in industrial wastewater treatment. Water Science and Technology, 47(11), 289-295. Novak, L., Larrea, L., Wanner, J., & Garcia-Heras, J. L. (1993). NON-FILAMENTOUS ACTIVATED SLUDGE BULKING IN A LABORATORY SCALE SYSTEM. Water Resources, 27(8), 1339-1346. Neyens, E., Baeyens, J., Dewil, R., & De heyder, B. (2004). Advanced sludge treatment affects extracellular polymeric substances to improve activated sludge dewatering. Journal of Hazardous Materials, 106B, 83-92. More, T.T., Yadav, J., Yan, S., Tyagi, R.D., & Suramapalli, R.Y. (2014). Extracellular polymeric substances of bacteria and their potential environmental applications. Journal of Environmental Management, 144, 1-25.